It's that time of year again, when Canadian Music Weeks takes over the city from March 11-14, with four nights of performances by over 500 Canadian and International artists throughout 40 downtown venues. Singer Becky Abbott will make her Toronto debut with a LIVE performance at the Hard Rock Café. Born into a musical family in Ottawa, Becky Abbott seemed destined to be a performer, blessed with a searing three octave vocal range, Becky has had the privilege and versatility to try her hand at just about every musical style but it's her natural affinity and god-given talent for all-out rock and roll. Her sultry voice is simply unforgettable and has been compared to Sheryl Crow, Bonnie Raitt, Chris Robinson (The Black Crowes) and Nikka Costa. For the last three years Becky has performed and recorded with Juno-nominated guitarist David Gogo, touring throughout Canada and the U.S. and is currently working on her own album along with doing some co-writing with Tom Wilson (Blackie & The Rodeo Kings/Junkhouse). So take this chance to see a star in the making! Join Mr. Bee and sixteen of his favourite musicians and singers including; DK Ibomeka, June Garber, Big Rude Jake, Julie Michels, Lyne Tremblay, Roger Clown, Terra Hazelton, Waylen Miki (piano), George Koller (bass), Tony Quarrington (guitar), Glenn Anderson (drums), Richard Underhill (alto sax), Christopher Plock (tenor sax), Alexis Baro (trumpet); with cameo appearances by Durham Region singers Dave Statham and Heather Luckhart. 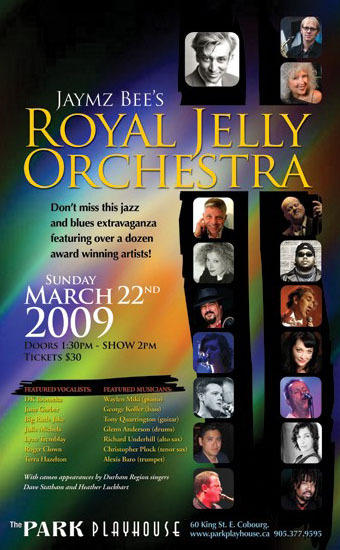 Last December The Royal Jelly Orchestra performed two shows open to the public and had such a great time they have decided to do more theatre shows for music lovers of all ages in 2009. An RJO show is never the same twice... Jaymz Bee and his ensemble work very hard on creating a unique and exciting repertoire…and it shows! A fun way to spend a Sunday afternoon…a great theatre in a small town... nine singers and a thrilling septet backing them up! It's worth the drive to Cobourg! 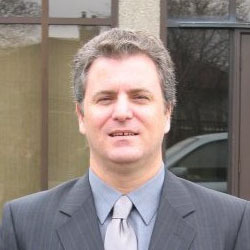 Dave Howard has worked in the music business since the early eighties and has never stopped working. 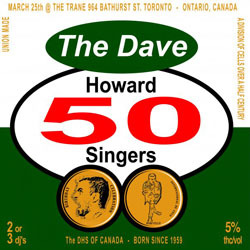 Dave began in 1982 by forming The Dave Howard Singers, an alternative rock group that featured Dave Howard (Ace Tone organ and vocals) and Max (his trusty drum machine). Whether you caught him at The Beverly Tavern or opening for The Pshcedelic Furs, he was always a true showman. After moving to London England and working with various rhythm sections he made several vinyl recordings and released a CD called "13" under the band name DeVoured, which he says, is how the French pronounce his name. Since then he has worked on soundtracks, jingles and dance music. He also produced and arranged "Sub Urban" by Jaymz Bee & The Deep Lounge Coalition, which was a hit on radio stations across the United States. Join Dave to celebrate his 50th and perhaps you’ll hear him croon some of his hits like "Stuff Me In Your Blender", "Road Warrior", "They Come They Go" and the UK hit (perhaps the first hip-hop limerick) "Yon Yonson". (physics) In a chaotic system, the ability of miniscule changes in initial conditions(such as the flap of a butterfly's wings) to have far-reaching, large-scale effects on the development of the system (such as the course of weather a continent away). SCENEandHEARD.ca, Canada’s evolutionary online news & culture magazine, hosts its first themed fundraiser for GiveMeaning.com - a Vancouver-based charity with international appeal. The event is labeled The Butterfly Effect as it accentuates how a small change in one place (being a $5 philanthropist), can make a difference on the other side of the world. Entertainment for the evening is provided by HOTCHA! DJ Maximus (djmaximus.net) and DJ Salty Dog (djsaltydog.com) and from Toronto’s Scratch Lab DJ Institute, will also be on hand to keep the night flowing smoothly.